** To see the animated .gif then please click on the thumbnail below. 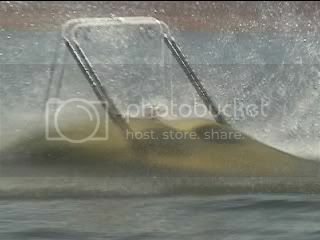 Looks like a heck of alot of fun...I'll have to try that as soon as the ice melts off the lake! (well, maybe I'll wait a little longer so that the family jewels don't go "ice cube" on me). Any other tricks that you guys know of to catch a thrill? 180's and 360's are always fun, just remember to be safe about it. how did that happen - dont tell me these things submerge if you take all power off in a straight line or did he stick it in reverse???? Yeah he let of the throttle, threw it neutral, and then threw it in reverse in a very quick motion...then wahla instant sub! I am very new to jet boats and so on a serious note, couldnt this quick-reverse thrust "damage" the jet system??? Also, I'm in the market for a year 2000+ Speedster, please feel to send your sales to me at gavinpugh@mail.com, thanks!! Should work if you just click the link now. Nice!!! Where are your passengers going!!! haha they thought we were sinking and going under. so they bailed!!!!!! This is a cool idea, though more videos would be nice. How about a photo thread on your personal speedster setups? Unless your boat is a POS - I can't imagine wanting to do this. How long after does it take to empty out? Lots of people do the sub moves in these. From what I have heard and seen it doesnt take too long to get the water back out. I dont do it because I got way too much money invested in my boat to sink it or ruin it.